Historic ‘Hardy House’ on Main St. w/ Fire Pit! Enjoy the beauty of historic Hardy, 'Gateway to the Ozarks', from this 4-bedroom, 2-bathroom vacation rental house built in 1924. From the large front balcony experience the activity of the town's Main Street and seasonal view of the river. The home, which is on the National Historic Registry, features cozy upscale furnishings, an impressive kitchen, sprawling yard, and accommodations for 8. Just steps from the home is Hardy’s Main Street for restaurants, attractions, and Spring River. Come enjoy the changing of the leaves and the beauty of the Ozark Mountains! 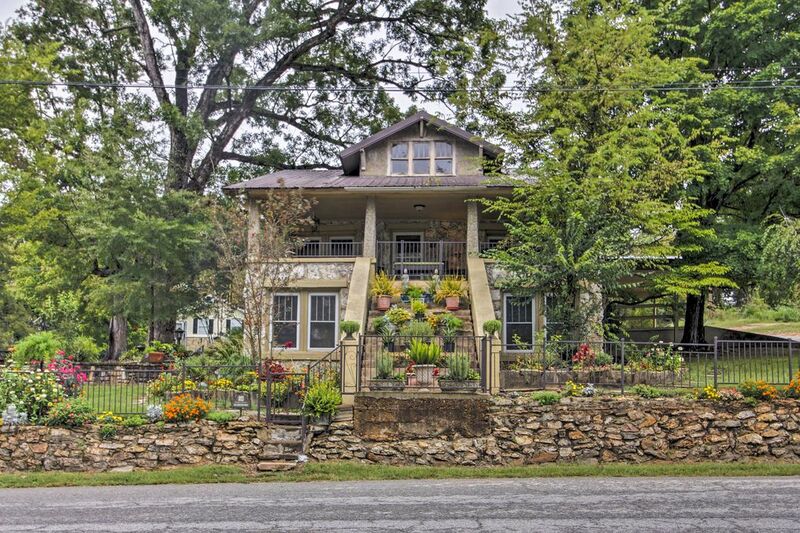 Enjoy the huge balcony of this beautiful stone house with ample seating for visiting and relaxing, or canoe down Spring River. Just adjacent to the balcony is a gas grill and an in-ground fire pit with seating, beautiful stone surroundings, and stacked wood waiting for you. All 4 seasons are the perfect time to come to Hardy! Inside the home, you’ll find a cozy living room, featuring plush furniture and a flat-screen cable TV. Just off of the living room sits a dining area with a large farm-style table, making enjoying home-cooked meals a breeze. Through the dining area, you’ll find a wonderfully decorated kitchen that comes fully equipped with a full refrigerator and freezer, a stove/oven combination, and a microwave. The space also offers a breakfast island with seating for 4 and large windows giving the area plenty of natural light. The fully furnished master bedroom includes a king-sized bed and offers an en suite bathroom. Upstairs there are 3 bedrooms with 2 Queen beds, 2 twin beds, and cozy lower ceilings much like and old English home. If you’re traveling with more than 8 guests, check out Evolve listing #423090 that is located on-site with additional sleeping arrangements for 2. Situated in a lovely community, steps from both Main Street and the Spring River, this home provides easy access to fishing, kayaking, canoeing, restaurants, shopping, and the area’s historic cemetery! Only steps from the house is the beauty of Hardy, where you can enjoy both outdoor and town activities within easy walking distance. You can easily get out into nature at the nearby Spring River, where you can take part in multiple water sports and trout fishing, or head into the hustle and bustle of town for a bit of historic culture, along with modern entertainment and restaurants. The area also offers multiple antique shops and fun local weekly activities! Head into town to take part in Friday Night Bingo or the Saturday Auction, just a few miles away, before unwinding with a nice meal at one of the local restaurants or coffee shops. If you visit in the fall, you can relax and enjoy the foliage in the beauty of the mountains! - Plenty of shopping and restaurant options nearby! - If you’re traveling with more than 8 guests, check out Evolve listing #423090 that is located on-site with additional sleeping arrangements for 2. Like going back in time... quaint and full of holiday cheer! Many thanks to the owners for their obvious TLC for their guests! Super clean and inviting... would heartily recommend! Just returned from 3 days in the Hardy House. Perfect location, great house and the fire pit was a real hit. There were 4 ladies. We loved the location to town. Enjoyed the porch and fire pit. Very clean and spacious. We would do it again! We were looking for a place to enjoy with friends and explore the mountains. We went with two other couples and the Hardy House fit us perfectly. The house is very comfortable, nicely decorated, and well equipped. The balcony was a great place to start the morning and we love being able to walk to the shops and coffee/eating places in town. We enjoyed it very much! Just be aware the trains are active in this part of the country and they go right through town. They were a problem the first night, but nothing a good pair of ear plugs cant alleviate. clean and comfortable, amities generous and well appointed, loved the vintage atmosphere and within walking distance to shops, plenty of parking. The house was clean. The owners were responsive. The location is good. The house was good for our friends getaway occasion. The backyard has a good grill and fire pit You will be in walking distance to the only breakfast spot on Main Street.